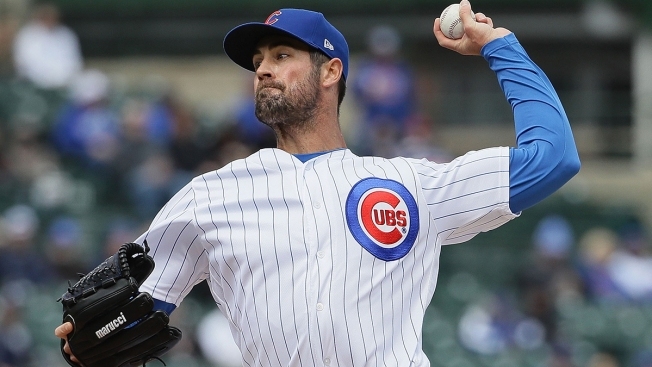 One night after Chicago Cubs pitcher Jose Quintana set a new season benchmark for quality pitching, Cole Hamels one-upped him on Friday as the Cubs beat the Los Angeles Angels 5-1. Hamels threw eight innings of one run ball, with a solo home run to Cubs nemesis Albert Pujols being the only blemish on his record. He also struck out six batters and didn’t walk any in a very efficient day at the office. As for the Cubs, they got plenty of offense with the wind blowing out at the Friendly Confines. Anthony Rizzo blasted his third home run of the season in the first inning, and catcher Willson Contreras hit his fourth and fifth long balls in the winning effort. David Bote also hit his first home run of the season in the game. The Cubs got off to a hot start in the first inning as Rizzo and Contreras both hammered long home runs. Rizzo’s blast, which came with Kris Bryant on base, travelled an estimated 472 feet to right field, and Contreras hit a 460-foot home run just two batters later to give the Cubs a 3-0 lead. After Pujols hit a home run in the top of the fourth, the Cubs responded with another blast, as Bote hit a ball over the left field fence to make it 4-1. Contreras wasn’t done in the game, as he hit a 443-foot blast to left field to extend the Chicago lead to 5-1. From there, Hamels and Brandon Kintzler cruised, limiting the Angels to just one run and four hits on the afternoon. The Cubs and Angels will battle again on Saturday afternoon at Wrigley Field, with Kyle Hendricks taking the mound for the Cubs. First pitch is scheduled for 1:20 p.m.